When a call is in progress you can record the conversation with the other party. To begin recording you simply click on the recording button on the active call panel. The red button will be displayed for the entire recording. To finish recording simply click on the button again or close the call. Please note that you can disable this option by changing the user’s profile in Profile section of the User Configuration page. Separately, you should ensure that the person you are recording agrees to this, with either a disclaimer on your IVR or by asking them, before pressing the record button. If a call is particularly important, you may wish to prioritise it on your page and add it to your Favourites by clicking on the grey star on the left to the list of recordings. Clicking on the star will change the star colour from grey to green and make the recording easily recoverable using the filter described in the paragraph above. 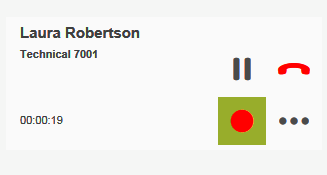 You can listen to the call recording by pressing on the “play” button in the recordings list; clicking instead on the green handset next to the play button you can call the number linked to the recording.